Look what I stumbled upon in my sewing room. I was spending some quality time in there trying to forge a path. (I am going to be there for quite a bit of quality time yet.) 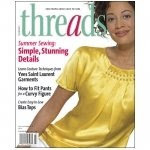 I came across the current issue of Threads magazine and voila on the cover is a picture of a blouse with the sleeves hemmed with a shell stitch. They used a catch stitch instead of a running stitch. Below is the link to their tutorial. I might try it with a catch stitch and see how I do. As always there is more than one way to skin a cat. This issue of Threads is the best in a long time. There are some great techniques in there. I particularly like the little "smocked" diamond strip. Great stuff!